Narconon Freedom Center Graduate Achieves 5 Years Sober! Narconon Freedom Center graduate sends in report of achieving five years of sobriety and having accomplished many of his life goals thanks to the drug rehab program offered by Narconon. It feels so good knowing that I took my life by the reigns and allowed Narconon Freedom Center to help me recover from my addiction. Narconon Freedom Center received an update this week from a past graduate of our drug and alcohol rehabilitation program. After over five years of being sober, the former student has accomplished many life goals that he never thought possible. Through his hard work and dedication to remaining sober, J.S. has and continues to exemplify what is means to live a life in recovery. Upon entering Narconon five years ago, J.S. can still recall what his mind state was when he hit rock bottom, “I was unhealthy, broke and mentally lost. I had no way out of the misery.” He remembers knowing that if he didn’t focus on his recovery now that there may not be another chance. Throughout his program, J.S. remembers making huge personal gains during each portion of his program. Most importantly, he recalls setting life goals for himself to accomplish, which he has and continues to accomplish today. While Narconon Freedom Center provided the tools that helped J.S. in recovery, it is him who is the true success here, for he has worked diligently to accomplish the life goals he set out for himself. By utilizing the tools provided in the drug rehab program, J.S. has been able to become a true example of what a life in recovery looks like. For more information on how to get a loved one struggling with an alcohol or drug addiction, please visit http://www.freedomtreatmentcenter.com or call toll-free at 877-639-2909. 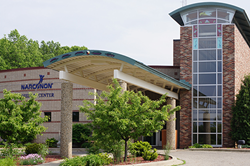 Narconon Freedom Center is a non-profit drug and alcohol rehabilitation program licensed through the state. The facility is located at 809 W Erie St, Albion, Michigan and has been helping individuals struggling with addiction for nearly 50 years. William Benitez founded the Narconon program in 1966 with the drug-free rehabilitation education researched and developed by American author and humanitarian L. Ron Hubbard. The drug and alcohol rehabilitation facility also provides drug prevention education to schools and community outreach programs.